Roma!!! 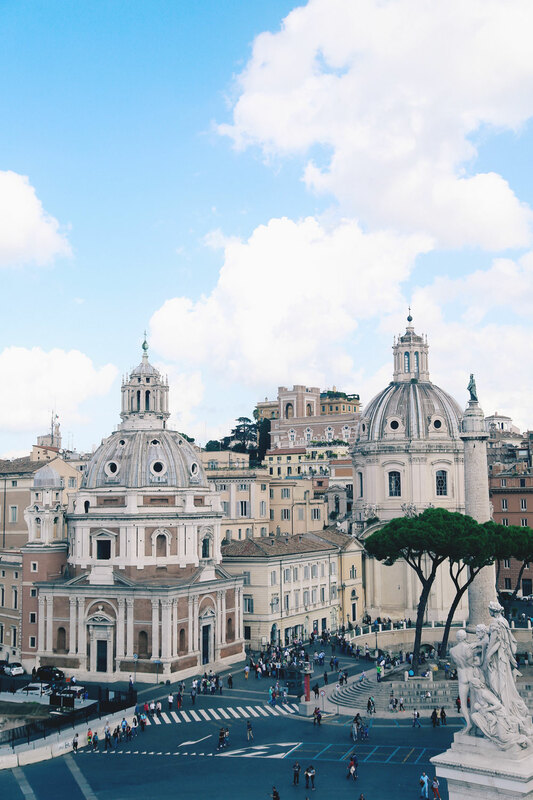 I have so many pictures from Rome I almost felt like I had to break it down into 10 different posts, but then I realized – why not just created an epic guide? 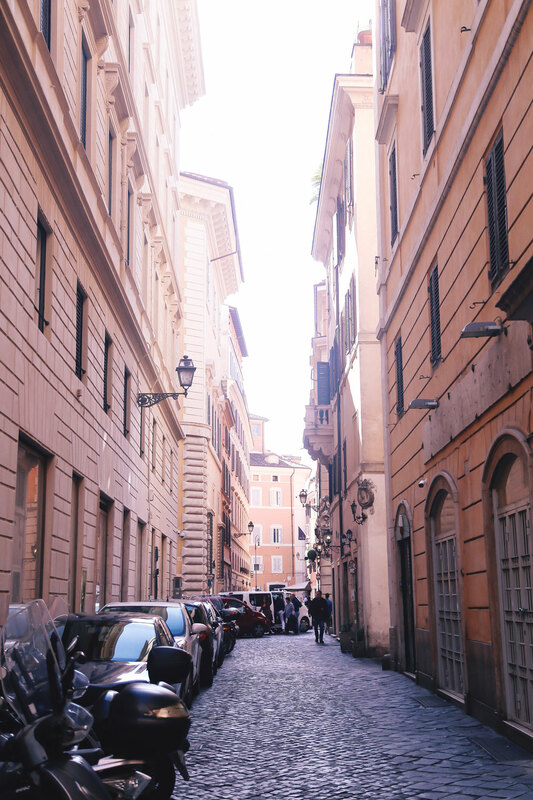 If you caught my last Rome post, I shared the beautiful neighbourhood of Monti, which is an absolute must. But while we were there for a good 5 days (more on our itinerary here) and were able to stretch out our visits to different neighbourhoods over a good amount of time, it got me thinking: what about if you only have 2-3 days in the Eternal City? How can you see it all? 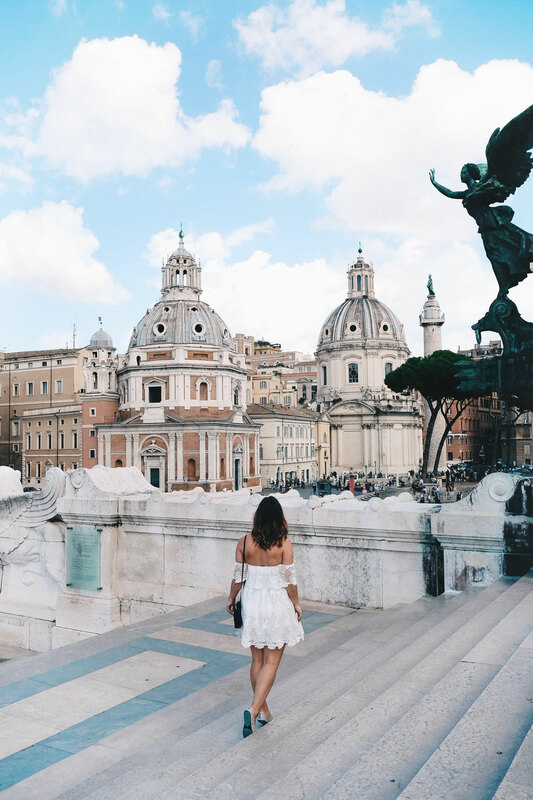 Again, this really sparked the inspo behind this guide – most people are likely not going to have a day to dedicate to each neighbourhood, so today I bring you an epic 2-day weekend in Rome travel guide so that you can cram as much into your visit there as possible! First of all, I should preface this all by saying that while this is a 2-day guide, I really think you should dedicate as much time as possible to this incredible city, for so many different reasons. It wasn’t my favourite city I’ve ever been to upon first impressions but after a day or two, I really fell hard. It’s definitely got some grit, it’s got some attitude (albeit, amazing, Italian attitude) and for me at least, it was more of an obstacle language-wise. French was my first language which means Paris feels like a second home to me (doesn’t hurt that I lived in France for a spell too! ), I tend to pick up on Spanish easily enough as a result and German I took in university. Italian…Italian is a whole other beast. It’s so beyond beautiful it’s ridiculous, probably the most beautiful language I’ve ever heard. But while languages are usually what I’d consider one of my strengths, I really struggled initially and there’s definitely a deserved wariness of tourists stumbling over basic Italian, so it definitely took me a couple days to start getting into a groove and to crack the surface of this truly eternal, endlessly vast city. On that note, not a bad idea to maybe start practicing with Duolingo or a similar app because as I learned after I got a slight grip on the language, it really endears you to the people if you’re making a decent effort! But the main reason you should give Rome some more time is because of its indescribable energy. It’s an energy that’s captures a history beyond what I can really imagine, what I like to think is just an innate swagger from being Roman (I’ve never seen cooler people in my entire life, this one guy in particular I became so fixated on one morning at a cafe Matt started referring to him as my new 50 year old Italian boyfriend all trip [side note: I wish]) and a true zest for life. I know that saying gets thrown around so much but you really can feel that palpable passion for living in the air when you walk around, from achingly stylish professionals zipping off to work on their Vespas to a raucous laughing group of beautiful Italian 20-somethings enjoying apero on a patio to the insanely animated roadside convos between two elderly men while puffing away on their cigarettes. We barely dipped our toes in the city and yet on the flight home (between coughs that rattled my whole body because I was coming down with bronchitis somehow by the time I left Venice), we both went over the whole trip and unanimously agreed that Rome just had this pull and this energy that really left an impression on us – I would go back literally any day, any time, and to that end, I’d also go again and again. Presumably giving you two full days here, so I’d kick off things in the morning by heading first thing in the morning to Cafe Faggiani in Prati, where Matt and I stayed (be sure to check out my Airbnb guide to Italy here!). This was undoubtedly our favourite cafe. This is where I met my cool 50-year old Italian boyfriend as Matt watched on, this is where the sweet server who served us every day outside told me I had the prettiest green eyes and I almost burst out crying because it was the first time we had a nice interaction in an Italian cafe (but that’s not because of anyone other than us, more on how to navigate Italian cafe culture properly so that you get the most out of your experience in a later story! ), the pastries are amazing, the cappuccino is something I still dream about…just trust me, you’ll want to visit. And it’s really not a bad walk across the Tiber River so even if you’re staying more centrally, super easy to get here! 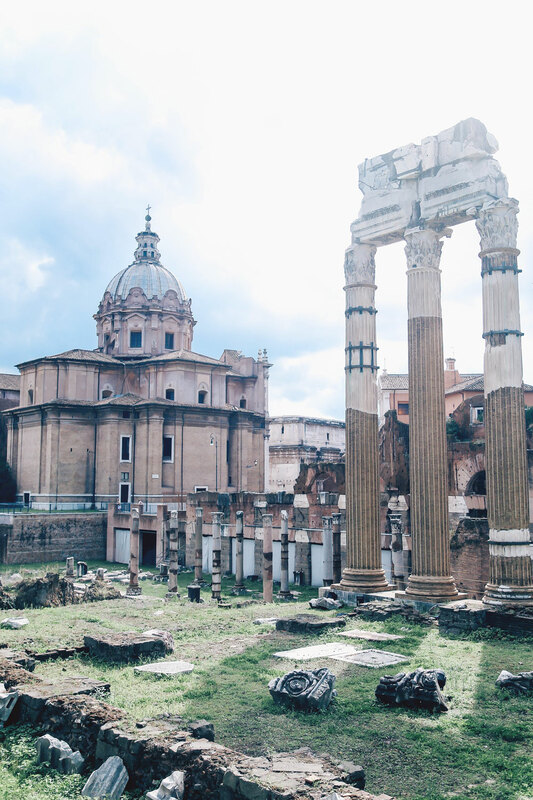 Wear comfy shoes and head on over as soon as you’re wrapped to the Roman Forum, where you’ll buy your tickets for both the forum and the Colosseum. Go early. Have water. Be prepared to stand in line. There are ways to get in (guys all around will have ways to sneak you in) but if you want to avoid these back door entries, just head with lots of time and get your tickets to the Roman Forum. I’d really advise you listen to the audio recordings so that you can get the most out of your tour through both but try to be efficient with your time! On the way from Prati to the main show of the Forum/Colosseum, you can stop by the Piazza Venezia, the central hub of the city (and where this shot above was taken). 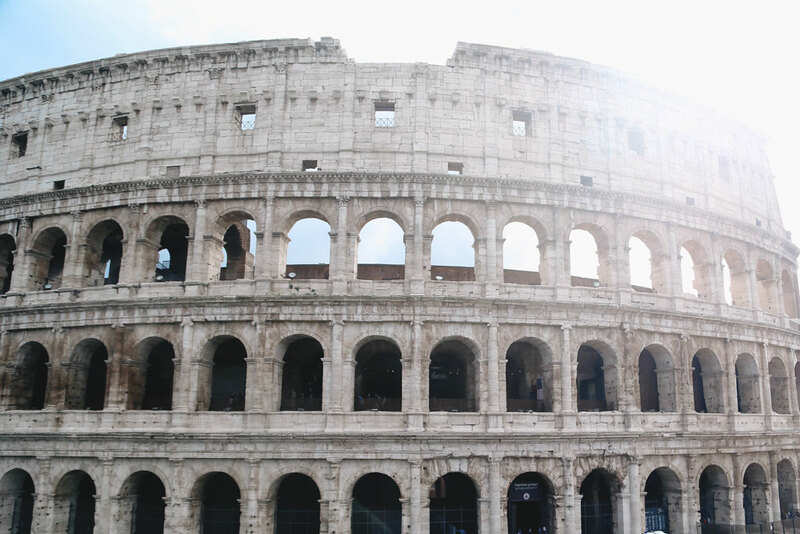 To get these amazing shots of the Colosseum, you’ll just head towards Monti up a series of stairs and precariously position yourself on a ledge. 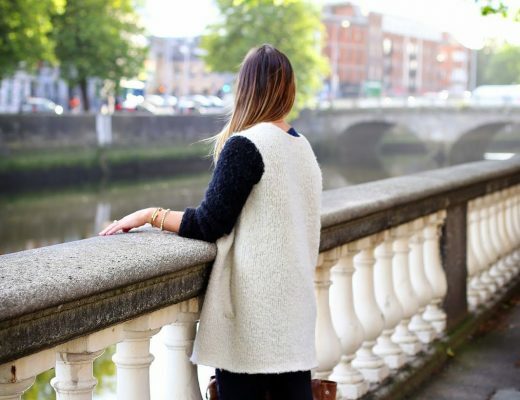 It’s worth it for the amazing shots, though if you have a fear of heights (which I do) you don’t have to stand! You can still get some great seated shots. I’d then suggest you make a reso in Monti for lunch, and yes, I’d recommend you make reservations for all your meals – places fill up like crazy and this is the first country I’ve visited where we really found we needed to have a calling plan so that we could make said resos. So worth it though because you want to eat the best food and not get stuck with yucky tourist fare! And on that note, refer to this post for my foodie recommendations in the hood, which is conveniently just tucked literally behind the Colosseum. 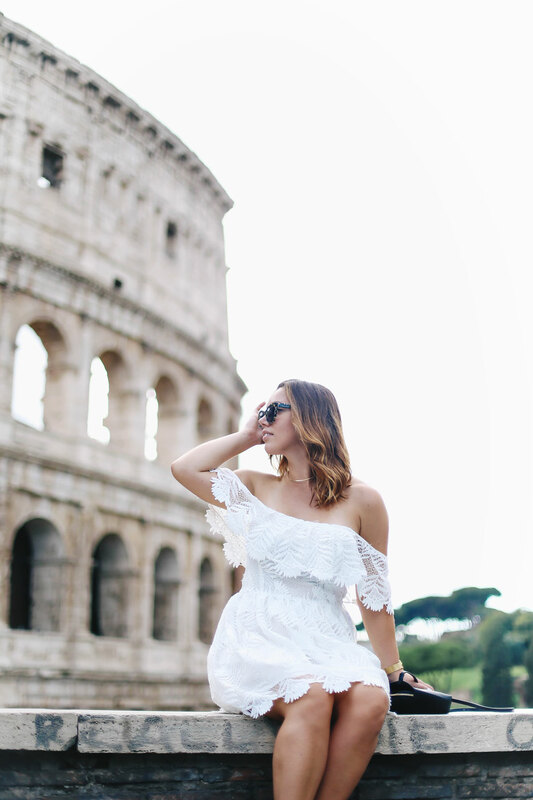 In keeping with this heavily iconic tourist trend, I’d suggest you then zip up to the Trevi Fountain (and by zip, I mean meander through the streets, finding pretty sights as you head up around every corner). 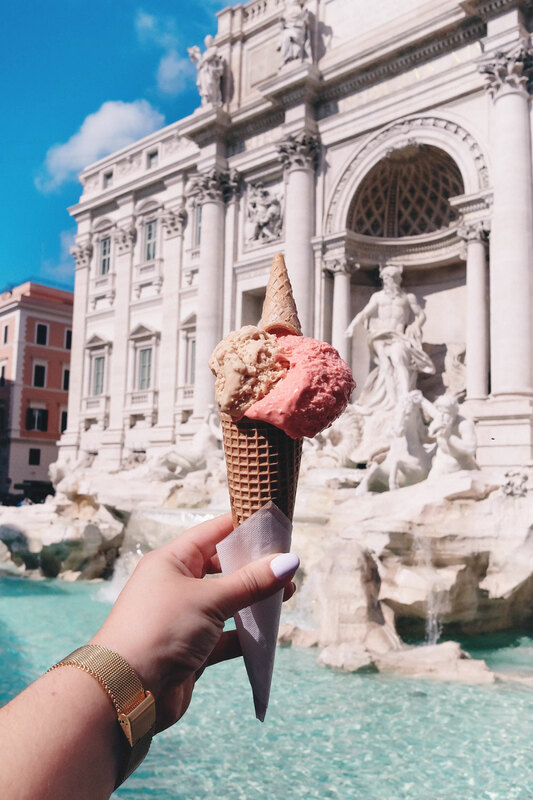 The gelato in this area is a total tourist grab and overpriced but I mean, for the Insta, you can’t really go wrong here. Feel free to drink from any fountain as you travel through the city or at the fountain itself, which is kind of a cool experience! Incredibly clean water, all coming through the ancient Roman aqueducts to these historic fountains. Trust me, I have just about the most sensitive stomach ever and I was totally fine (and refreshed)! 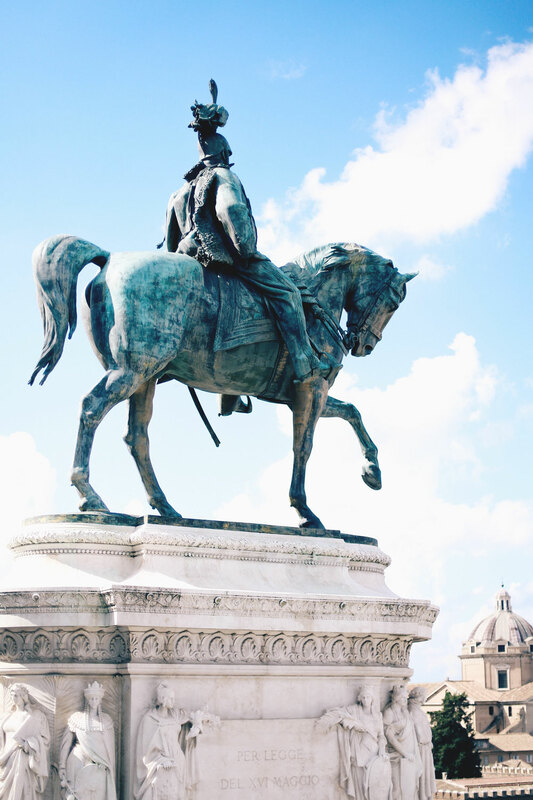 I’d wrap up day one by then heading to Piazza Navona – there are actually a surprising amount of good places to eat here, so just use your best judgment and poke around until you find a good place for apero and then for dinner. 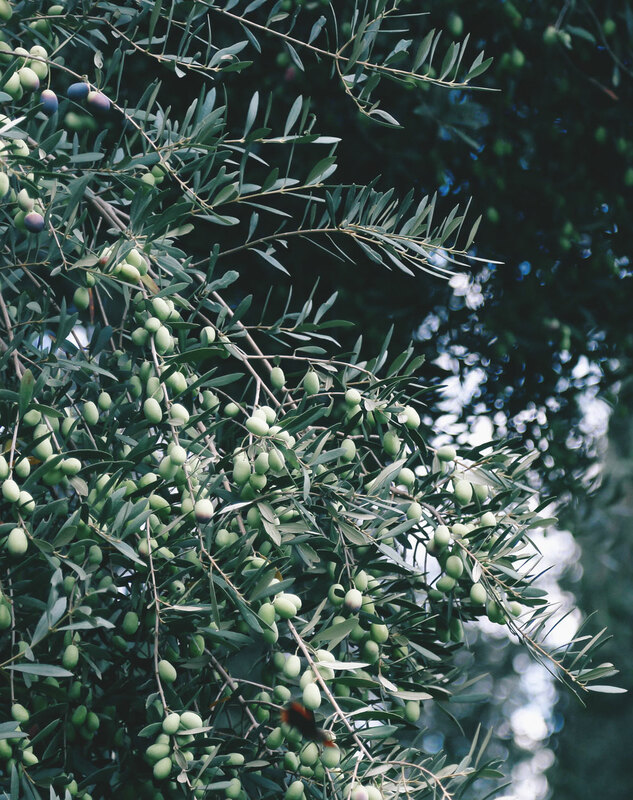 We were desperate to get to try Colline Emiliane but this was on our first day and we quickly learned you need resos. So even before you take off in the plane, I’d suggest calling ahead and making a reservation here because it’s supposedly amazing, it’s right near the Trevi Fountain (so super local) and will save you from eating at a tourist trap out of starvation/desperation! Head to bed early then because the next day is stacked. Now here’s a blitz through, and pardon the lack of pictures because they’re following in a separate feature! Matt and I were definitely flustered our first time at Sciascia Caffè (again, our first day in Rome and we didn’t even have a slight handle on the language or how to order at cafes – that’s all coming for you soon though so you don’t go through the same blunders we did!). But the cafe undoubtedly has some incredible coffee, delicious pastries and a genuine experience. You won’t get more Italian than this little joint. I would zip from here (first thing in the day, of course) and head across to check out the Spanish Steps, really just so you can say you did it. It’s not too far from the cafe and we kind of liked our little routine of starting in Prati (where most of the amazing food is) and ticking off one of our tourist to-do’s centrally. I would then head back over to Prati and get an early lunch from the famous Pizzarium Bonci – we were lucky to be staying two blocks away and had at least three slices per day each from this incredible place. They even remembered us and gave us some extra treats! It pays to be nice, even when you’re a dumb tourist who can hardly speak the language! Bellies full, I would then head over to Vatican City and book a midday tour. A tour, for me, is key, and I’ll be sharing the incredible experience we had with Walks of Italy soon that breaks down this whole day for you. It’s just so dense and so historical that you’d just be overwhelmed otherwise, not to mention you skip the massive crowds. I won’t get into too much deal with the Vatican because I’m covering it in a separate post but it’s definitely worth seeing for the Sistine Chapel alone. Blew my mind (I also had some really messed dreams with religious undertones and imagery after that). I would purge the admittedly heavy sights, stories and sounds that are part and parcel of a Vatican tour by zipping down to Trastevere, an area that while more touristy now, is still so charming and definitely one of the more picturesque areas of the city. Get some gelato at Fior di Luna Gelateria and then you can hop in anywhere for apero (if you’re not familiar with apero by the way, it’s a happy hour like interlude in the day before dinner in which you get drinks and sometimes for a set price [though sometimes just for the cost of your drink, especially in Venice where apero originates from] you can help yourself to a bottomless buffet). People watch and let the magnitude of all that you saw the past couple of days sink in, and by all means, get an Aperol Spritz if you haven’t already! My fave drink ever, I must say. And now, one of my fave meals: the insanely simple, insanely delicious cacio e pepe (translates directly to “cheese and pepper”), enjoyed at (where else?) the famous Cacio e Pepe, up the river from Trastevere in our zone of Prati. Matt and I dug into huge plates of these with a ton of house red wine and it was the simplest, most beautiful, delicious meal in our whole Rome experience (with the exception of Bonci, but we really let our Bonci cup runneth over by going literally every day). This is such a traditional Roman dish in a very traditional and authentic setting. The staff was beyond sweet and this was officially the first time I got a compliment on my Italian! I’d really perfected asking for vino, my most important staple. You can grab some more gelato from Al Settimo Gelo or do as Matt and I did and pass out, bellies so full. And that’s that! Go wander the town all night and have a blast or tuck in early for your next stop, which for us was Tuscany (coming to you next week!). 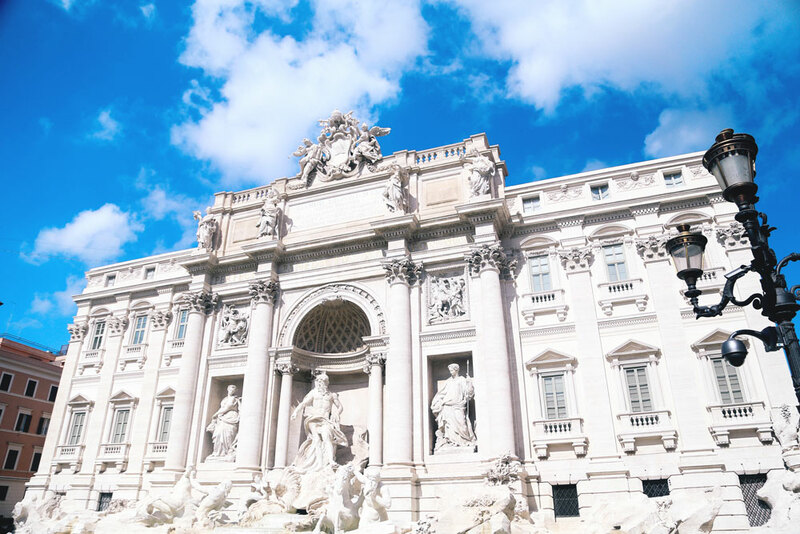 Now full disclosure, this itinerary leaves out a ton of Rome but quite frankly, while this was a packed two days and you can only pack so much into a couple days, any itinerary of Rome will never be enough. I truly believe you could live there your whole life and never really know the whole city. It’s just so dense, so historical, so magical! But I hope this gives you a head start to your planning and that you have a couple places to call up, to see and to experience now! 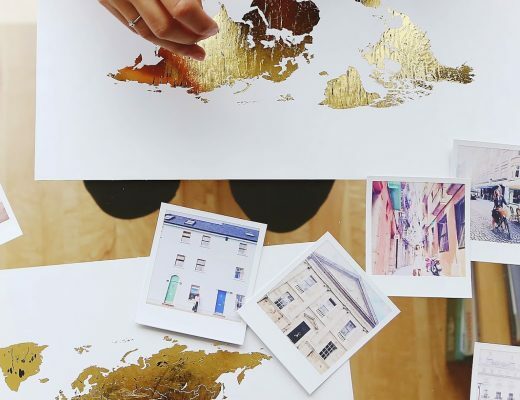 I have a pin below so that you can either save it for future plan it or pin it to your travel board on Pinterest! Finally, can’t recommend Gigi Guides enough for any Italy travels, especially through Venice, Florence, Rome and Cinque Terre. So many great insider recommendations, accommodation/dining tips and general lay of the land research in each regional guide! And with that, I’m off for the weekend! Happy Friday lovelies! 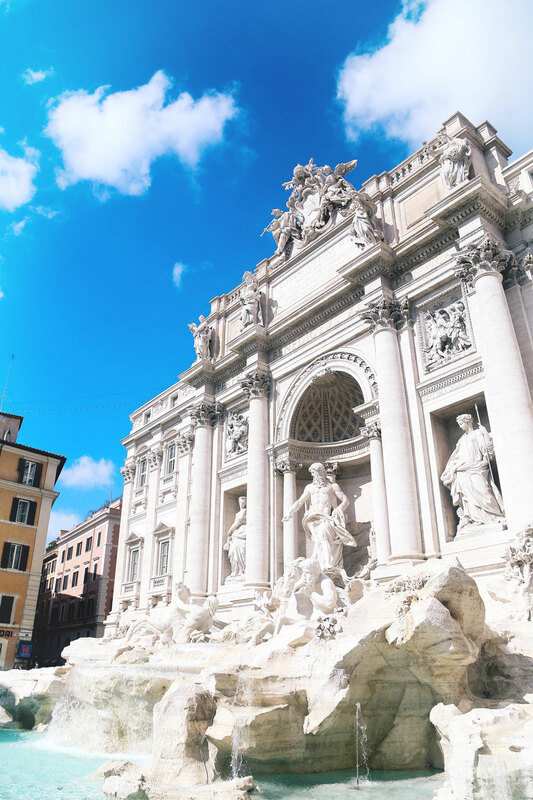 The trevi fountain is just beautiful! I love you shoes btw! I cannot say enough how much your travel/Italy posts are appreciated!! Heading there in September and it’s all a bit overwhelming with how much there is to do and how culturally rich it is! Taking a lot of notes from you 🙂 Also, beautiful, beautiful shots as always. Beautiful! Your dress is so pretty! 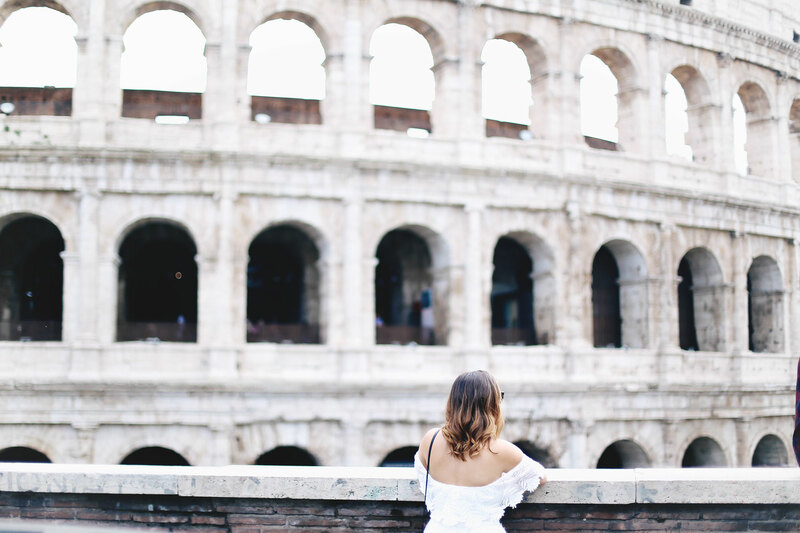 It looks like you had such a lovely time – I’m totally jealous of the spot you found for pictures at the Colosseum, it’s too perfect! Love this post! I see you are wearing Tieks in one of the pics……are they really the most comfortable flat? I’ve been trying to decide whether to splurge or not! They are really VERY comfy – and they last forever! I think they’re seriously worth the splurge personally!